This Italian fashion designer started working with fabrics at the age of 12. When she was 31 she presented her collection for the first time during Milan Fashion Week. 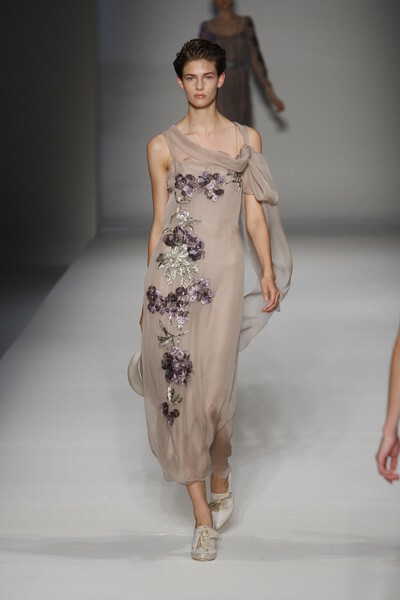 About the designers: Alberta Ferretti is an Italian fashion designer. She designs for Alberta Ferretti and another label, called Philosophy di Alberta Ferretti (for younger women and less expensive). Before she had her own fashion label, she had her own boutique in Cattolica, Italy. She designed her first collection in 1973 and started showing her clothes on the runway of Milan in 1981. Besides her two clothing lines Ferretti also heads a manufacturing company that makes and distributes the lines of designers Narciso Rodriguez and Jean Paul Gaultier, among others. The clothes are: very feminine and made out of delicate fabrics. The Alberta Ferretti dress is often slim and has folded pleats, separated by rows of tucking. Type of clothes: little elegant dresses are Ferretti’s trademark. Signature: Alberta Ferretti’s designs often are twisted, tucked and draped. The clothes are also regularly layered. Many of the dresses are cut high in the front and draped low in the back. Alberta Ferretti takes inspiration from many cultures, not just the Italian one. Remarkable: Alberta Ferretti would never wear a pair of jeans. She says jeans don’t look good on her body, are not flattering and not comfortable. Philosophy di Alberta Ferretti was first called Ferretti Jeans Philosophy for five years. Awards: Alberta Ferretti was named best female entrepreneur in the state of Emilia Romagna, Italy, 1991.